he writes mostly about user experience. When I saw Google drawings on a Twitter update a few weeks ago, I didn't really think about it until I got a feeling I might not have understood a rather complex problem at work. I drew a diagram and asked my colleague to edit it in case I had misunderstood him. It worked out well, we're still using the drawing as a basis for discussion, and it is constantly being refined as we go along. So taking the next step and trying out a wireframe was an obvious decision. 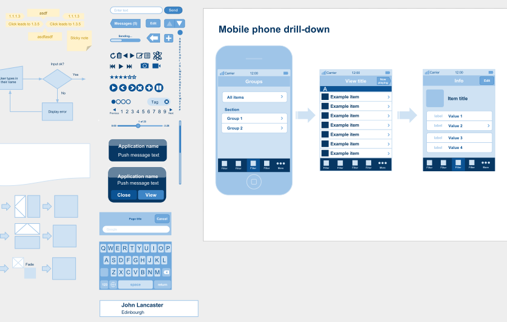 For quite a while I’ve been wanting a simple and fast way to burst out interface ideas, and then quickly share them with my colleagues in Düsseldorf and London. Since a relatively large portion of a wireframe looks like something I’ve sketched out before, I figured modifying a template like a list view or a landing page would speed things up. In fact, I wanted to speed it up to the point where I all I had to do was to add a few words before I had a wireframe. From the templates I extracted the scroll bars, buttons, and sliders and put them in the gutter outside the drawing’s canvas, ready to be duplicated and dragged onto the wireframe. 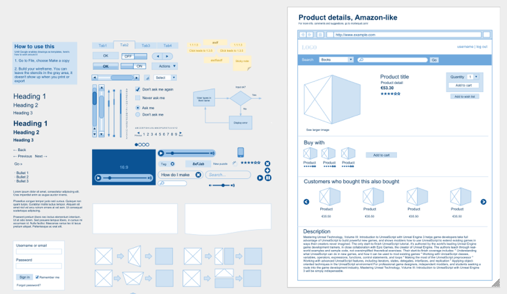 When you have several individual wireframes it can be a neat thing to pack them all up into one single document that you can send around, have people print out, or even present in meetings. Since there’s no way to import a drawing into a presentation yet, here’s a trick using the web clipboard feature. You'll still be able to edit the imported drawing should you need to. Go to File > New Presentation. A blank presentation opens in a new window. Switch back to your drawing and select everything. Switch back to your presentation and paste your drawing using the web clipboard. I'd love for this to be the beginning of a shared wireframe template repository in Google Docs. For now, I've shared a folder in which I'll add user contributed templates and stencils. Get in touch if you want to contribute. I hope you'll enjoy the templates and that it will help you actually sketch out your ideas rather than just describe them in words. As Dan Roam said in his keynote at this year’s IA Summit, “The person who draws the picture wins." Guest post: Morten Just is a product manager in Vodafone. Based in Copenhagen, Denmark, he spent most of his career as an interaction designer churning out wireframes and diagrams, and also co-founded Imity, a Bluetooth-enabled social network for mobile phones in 2006. On his personal blog he writes mostly about user experience.